Thank you to the Junior League of Charlottesville for their generous contribution to our community here in Soutwest Florida! Their support for our community post-Hurricane Irma made possible the donation of the items below to Eva’s Closet. 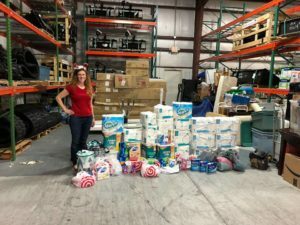 The many families and individuals that are still working to get back on their feet received the basic necessities like toilet paper, paper towels, shaving items, toothpaste, floss, soap, or feminine products to name just a few necessities that we were able to purchase with the donated gift cards! A huge thank you to the Junior League of Charlottesville!